Fuzz Townshend: Think like a 21-year-old! As I’m beginning to knock on a bit, I sometimes find it helpful to step back in time and take a look at the old me, the 21-year-old currently still happy and healthy inside my head but, in reality back in 1985, casually dismissing almost everything dating from after 1969 as banger material. Here in 2016, I’m pretty much of the same opinion, cue controversy, but once behind the steering wheel of a modern classic, let’s say anything dating from 1990 to 2000, I can feel the joy. In my fleet there are two such vehicles. My Land Rover Disco’ Series I and my Jag’ XKR. If I 1985-ise this pair, I’m driving a 1962, Series II 88in Land Rover and a 1968 2+2 Jaguar E-type, both of which are perfectly acceptable. My Austin Seven becomes a 1903 Wolseley, with a replica body, which is also eminently acceptable. So, excuses for modernity made, what have I been up to recently in the old crocs? Well, let’s start with the A7. For too long, this little car has sat unfinished in various locations about the UK. I’ll admit that I didn’t really have a direction for the project. Period replicas are compelling, but my Seven has a rudimentary and rather charmless square cut bathtub body. However, its chassis features flattened springs and in order to allow the combination to be driven, I secured the radiator using thick steel strips bolted from the body to its shell. Thus, suddenly, a diminutive rat-rod has taken shape. It is pure Austin Seven and it certainly isn’t quick even by post-1950 standards, but, boy, it really is a whole heap of fun. 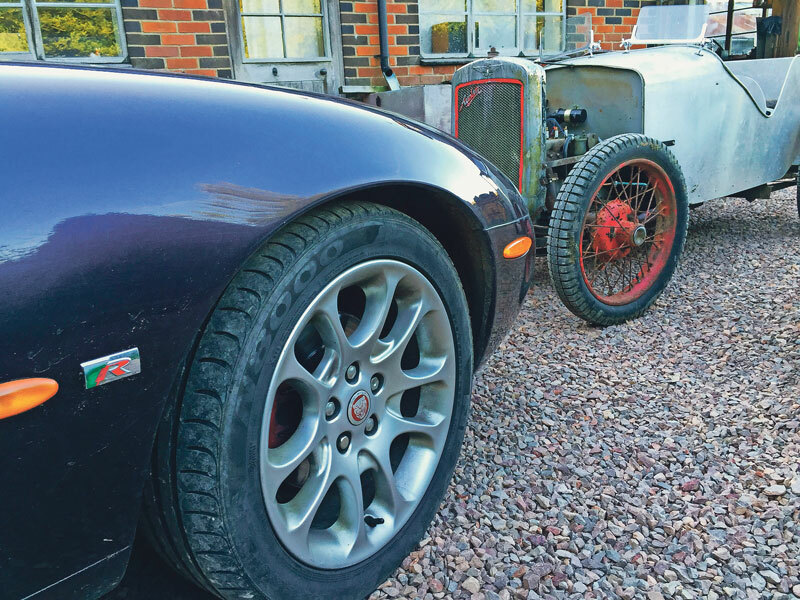 Little more than a bit of tin on wheels, with an engine of dubious health, a slightly porous final drive housing and an unpredictable gearbox, it is a delight to drive, having been tested on the dirt track between our place and the neighbours’ houses. Once again I’m reminded that I’m getting old because I can safely saythat knocking about in this little brute is as much fun as one can have fully clothed. All that remains practically is to properly fit the Autosparks loom and source some headlights and a mounting bar, followed by a hopeful club-supported representation to the DVLA, registration, insurance, third party inspection and then some more fun. The Disco’ is a car for which I have plenty of respect. My 200Tdi example has been with me for three years now and has achieved 50,000 miles in service, on trips all over the UK and to mainland Europe too. It’s not exactly a sparkling machine performancewise, but I would trust it to get me anywhere in an emergency. Currently I’m fitting a few replacement brake pipes for perhaps its last MoT test in my ownership although, as I’m so fond of the old machine and because it’s had a new nearside front wing to replace one damaged in the brief Shropshire freeze, I might permit it a stay of execution. While the Disco’ may lack pace, the Jaguar XKR places dollops of full-fat whipped cream power through its custard auto’ gearbox to provide a thoroughly entertaining and capable long-distance cruiser, but its lumbering weight is made manifest by its relatively short-lived suspension joints and bushes which I’m currently replacing piecemeal. In fact, while in the process of removing the offside lower suspension ball joint, a couple of workmates and me received the shock of our lives. Using gentle oxy-acetylene heat to assist removal of the joint in-situ, there was suddenly an extremely loud bang and the three people involved immediately turned toward the gas bottles, fearing some sort of blow-back. In the air was an acrid burnt smell that was unpleasant on the throat. The bottles were immediately turned off, but nothing appeared to be amiss until, looking back at the balljoint, we realised that the heat had expanded the remaining grease to the point where the forces were great enough to fire the ball-pin out like a bullet. It was rather lucky that none of us had our feet in the direct line of fire, as the pin made quite an impression in the concrete below. Nearly 40 years since I was first put to work as a numberplate maker and welding fire watch as a 12-year-old during school holidays at my cousin, John Wardrop’s, Regent Motors garage in Linlithgow, West Lothian, I’m still learning that cars can be temperamental things.